The City of Houston Municipal Courts Department (MCD) is proud to offer TEEN COURT! This program is specifically designed for teenagers in an effort to promote an interest in those considering a career in law and/or criminal justice. MCD”S TEEN COURT is made possible through various partnerships, including the High School for Law Enforcement and Criminal Justice, the Houston Police Department’s Youth Advisory Council, and the Municipal Courts’ Juvenile Case Manager Program. The collective goal of the TEEN COURT is to provide education, training, and experience for our participants. Spark an interest in the legal profession. TEEN COURT is a court for teens, by teens. Our TEEN COURT hears real cases of juveniles who have received citations, and they are responsible for determining the sentences of teen defendants. How it works: Juvenile defendants plead guilty or no contest and choose to have their cases adjudicated via TEEN COURT. Our teen volunteers work with real justice professionals to prosecute or defend the defendant. At the conclusion of the case, teen jurors are responsible for hearing the cases and deciding the punishment. The judges presiding over TEEN COURT are official Municipal Court Judges. Defendants can be sentenced to serve subsequent jury terms as a form of punishment. TEEN COURT PARTICIPANTS MUST BE ENROLLED IN HIGH SCHOOL. 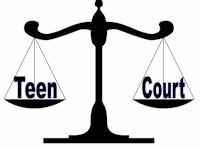 TEEN COURT meets on the last Wednesday of each month from 5:30pm to 8:00pm. Dinner is served from 5:00pm to 6:00pm. Sound interesting? If you would like to become involved in TEEN COURT, please email us at teen.court@houstontx.gov for additional information and application packets. REAL CASES, REAL DEFENDANTS, REAL JUSTICE!!!! BECOME A PART OF THE TEEN COURT TEAM!